Ever since Mike Scott first brought The Waterboys to public attention their career has been marked by storied departures. Staking out bold, new territory with fresh approaches and inspirational collaborators has been the defining factor of Scott’s creative flow. Now Out Of All This Blue, The Waterboys’ 12th and first double album is maybe the most brilliantly daring and accomplished reinvention of The Waterboys to date. Here are love songs as impassioned and unbridled as any in Scott’s canon: the sassy philosophical swing of Do We Choose Who We Love, the urgent Morning Came Too Soon, the unabashed fanfare of Love Walks In. On the incident-filled street symphony New York, I Love You and the anthemic keynote Nashville, Tennessee romantic attachment is to place rather than partner. Elsewhere self-made myths (the rambunctious, careering Connemara Fox), living legends (Mister Charisma), pumped up egomaniacs (Monument) and grotesque rock’n’roll lore (The Hammerhead Bar) illuminate an album that’s kaleidoscopic in scope, rich in character and location, teeming with musical and lyrical detail. Puck Towers, Scott’s former Dublin residence, now houses both his own studio and that of his wife, Japanese artist Megumi Igarashi, also known as Rokudenashiko (not at all coincidentally title of a heart-baring ballad on Out Of All This Blue). Its walls are festooned with pictures of Stones, Beatles, Marvin, Jacques Brel, Nina Simone, a masque of the god Pan (‘the real boss,’ he grins), shelves of books, instruments, vinyl albums and CDs. On the desk at one end, speakers on either side, is the desktop computer where Out Of All This Blue was assembled, additional work being undertaken at Megumi’s home in Tokyo. Full of the inspiration that comes from playing an American tour in such fabled music cities as New Orleans and Austin, Out Of All This Blue was planned as a double album from the outset. “I’d never made one before and from the start I thought of Out Of All This Blue as 4 sides of vinyl. The first side is love songs and the 4th side is love songs to my wife. Side 3 is songs are about others, many of them about musicians – Hammerhead Bar, Mister Charisma, Monument. Keyboard player Brother Paul, who became a fulltime Waterboy after he joined Scott and Wickham on a radio session in Kentucky four years ago, was the inspiration for the first Out Of All This Blue song to get a public airing. Even before the album’s release Nashville, Tennessee has become a live favourite. Written on a mid-tour flight from Atlanta to Nashville, it was learned by the band at soundcheck that night and encored at the show. “You can hear the Nashville audience yelling and hollering on cue,” he says, still half-amazed by the instantaneous chain of reaction. That recording is on Out Of All This Blue’s bonus CD but the version on the album itself is another live recording, from a later festival performance. Scott is singing of Brother Paul when he invokes the compelling image “one part psychedelic gypsy, three parts blue-eyed refugee”, though the line could just as easily be a nod to his own musical journey. The album’s other sensuous string arrangements and rapturous horn charts were created by Spacebomb Collective’s Trey Pollard. On the chanson-like Girl In The Window Chair, Pollard’s stringed swirl has the headiness of a Brel lament. “Brel was a peerless master. I’m only in the foothills of his mountains, but I wanted The Girl In The Window Chair to have his kind of intensity” Mike admits. Out Of All This Blue contains multitudes – as befits the man who first heard the Big Music growing up in Edinburgh in the 60s and has followed his dream down all the days since. Protest, eulogy, soulful horns, heady strings, blisteringly hot guitars – Scott’s own playing makes significant impact throughout, particularly on Morning Came Too Soon. There are swaggering funk-fried memories of love that never was (Santa Fe) and free-flowing celebrations of new love’s ecstacy (Didn’t We Walk On Water). 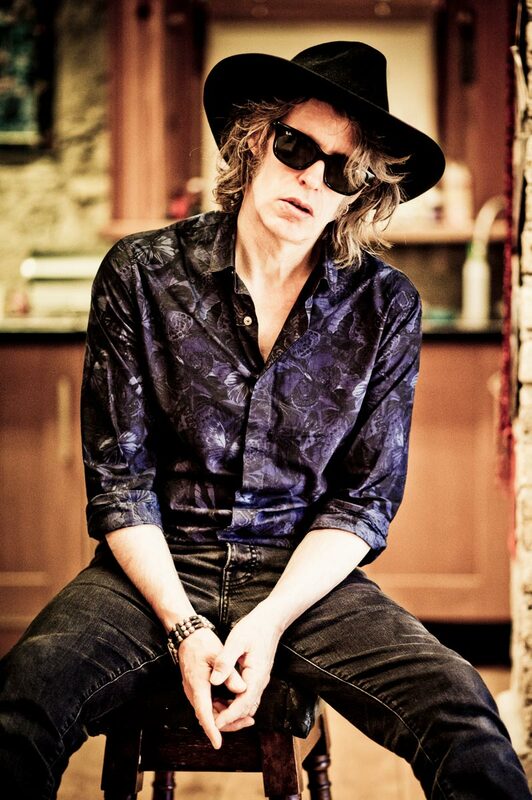 The beats are so voluminous, so frenetic, pulverising and energising, that the next time The Waterboys tour it will be as a two-drummer nine-piece band.